It is normal in the Asian region and now also enters the German baths: the shower toilet. The elegant shower toilet seat SensoWash® not only convinces with the look, but also with its functionality. In addition to the automatic lowering system in the toilet lid, with which you can easily open and close the lid, you can also control the shower WC by remote control. With Duravit SensoWash, you can enhance the pure feeling of well-being, combine it with hygienic comfort, dress it in a unique design and experience the pure lifestyle for the bathroom. It has been proven that it is more hygienic to wash with water instead of toilet paper after the toilet. With the buttocks shower, you have the possibility to adjust the water temperature, the water quantity and also the nozzle position individually to your needs. Really great is the fact that you can save your setting. So, you always have the best and most comfortable setting ready. The nozzle of the shower WC is also hygienic because it cleans itself before and after each use and is overdrawn with a stainless-steel surface. The standards of hygiene and cleanliness have never been as high as today. With a movable shower nozzle that moves back and forth during cleaning, you achieve maximum hygienic comfort. The water jet cleans and massages you at the same time (just SensoWash® Starck E). The Lady shower has been specially tailored to female needs. A gentle jet of water cleans the female private parts from a separate nozzle, which cleans the body area particularly gently and pleasantly, as you wish. Of course, you can adjust the nozzle to your individual needs. The nozzle cleans itself before and after each use, so that the standard of hygiene is maintained high. You can choose between two different models. 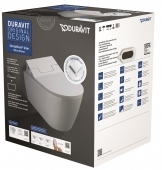 With Duravit SensoWash® Slim, you choose a very flat and puristic version, which provides the essential functions of a shower toilet. Maybe you would like to have a real design object in your bathroom? Duravit SensoWash® Starck E combines comfort with hygiene and technology and looks fine due to the subtle design. 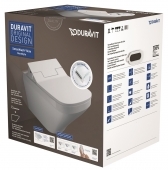 With a shower toilet seat, you can combine all essential functions of a complete shower toilet – this is the claim of Duravits SensoWash® Slim innovative shower toilet. Due to the flattened design, which perfectly adapts to the shape of the toilet, a modern and innovative shower toilet is created. The scratch-resistant and hard surface gives the flat toilet seat the necessary stability and quality and thus protects the technology from external influences. The reduced form consists of a non-porous material that meets the highest hygienic requirements and thus ensures cleanliness. A night light for the toilet bowl is also available, so that even at night everything runs smoothly when you have to go to toilet. There is robust technology inside the toilet, which leaves nothing to be desired. The shower WC can either be operated with the buttons on the side of the seat or you can take the remote control. With the remote control you can select the water temperature, the position of the spray arm heads and also the various functions such as the comfort, the lady and the normal buttocks shower with the remote control or the keypad. Simple to operate the seat, so easy is the maintenance. The SensoWash® Slim seat set can be removed and cleaned with just one single handle. 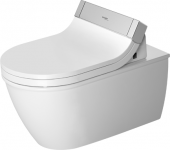 The Duravit toilet seat SensoWash® Starck E has a reserved yet striking design, that radiates modernity and perfectly harmonizes with the respective toilet models of the different design lines of Duravit and acts as a logical design continuation. Very classic and sophisticated, typical Phillip Starck. The surface consists of a scratch-resistant and a stable material, which offers enough protection for the technology. The technology in this shower-toilet seat is really amazing. With the modern remote control, which is very handy, you can use practically all SensoWash® functions. The special thing about this: as soon as you take the remote control in your hands, the control panels start to light up. 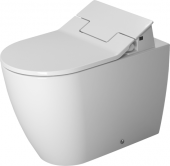 For example, you can open and close the motor-driven WC lid and toilet seat by the push of a button. This is practical at night and looks smart when the individual buttons light up. And if you do not need the remote, you can simply plug this into the magnetic mount. You can choose between three different shower variants: the buttocks-shower, the comfort-shower and the lady-shower and enjoy the cleaning with the perfect amount of water, the optimal water temperature and the best position of the nozzle. You can save your favorite settings and retrieve them at any time using the remote control. You have the option to change the shower nozzles, as each Duravit SensoWash® E shower-toilet seat comes with two shower heads. One shower nozzle has a fine and gentle water jet and the other has a stronger water jet. You can decide what you like better. It becomes even more comfortable: with the heated toilet seat, you no longer have to be afraid of a cold toilet seat, instead you can relax. But what if you must go to the toilet in the middle of the night? No Problem, Duravit SensoWash® Starck E has a night-light that will surely illuminate your way to the toilet. So, you can relaxed go to the toilet. By the way: the installation is also relaxing because the shower toilet seat is delivered ready for installation.